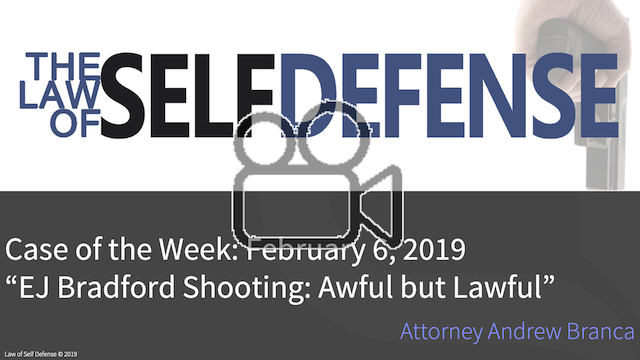 In this Case of the Week we take a look at the “awful but lawful” shooting death by police of EJ Bradford in Alabama. On November 22, 2018, an Alabama police officer shot and killed EJ Bradford Jr., a black male, while responding to a shooting in a shopping mall. It would ultimately turn out that Bradford was himself a good guy seeking to intervene against the person who was the unlawful shooter. Given that Bradford was not a violent bad actor who needed to be shot it is reasonable to ask whether the officer’s conduct was lawfully justified. Yesterday the Alabama Attorney General issued a report of their investigation and conclusions. That full report is embedded at the bottom of this post. For purposes of this COTW, however, I’ll provide an outline of the relevant legal analysis framework and a summary of how the AG report determined the facts and how those facts aligned with the law to arrive at their conclusion. First, it’s key to remember that the law does not require us to make perfect use-of-force decisions, although that would, of course, be ideal. Rather the law requires us to make reasonable use-of-force decisions. It is permissible to make mistakes in your use-of-force decision-making, so long as those mistakes are reasonable mistakes. This is true for both law enforcement and non-law enforcement use-of-force decisions. This condition of reasonableness is one that matters because an unreasonable mistake that results in a death is pretty much the definition of manslaughter. Further, reasonableness must be determined from both a subjective and objective perspective. First, what matters is not what the facts actually were, but how those facts appeared subjectively to the person who used force. Second, we must consider whether an objectively reasonable and prudent person, possessing similar skills, training, and knowledge, and in the same or similar circumstances, would have shared that subjective perception. With that framework in mind, let’s consider the facts as determined by AG’s investigation and described in the AG’s report. The police officer in question was on duty in the crowded “Black Friday Sale” shopping mall when he heard shots fired nearby. Unknown to the officer at the time, these shots were the result of one Erron Brown shooting a Brian Wilson, actions that took place outside of the officer’s sight. In response to the fired shots, the crowd of bystanders immediately began rapidly fleeing the scene. Upon hearing the shots fired the officer drew his service pistol. He almost immediately observed a male, later identified as Bradford, gun in hand in a firing position, moving away from the officer and closing on the apparent gunshot victim who was leaning on a railing and being assisted by a friend. Everyone except Bradford (including the actual shooter) was moving rapidly away from the location of the gunshot victim. The officer perceived that Bradford, gun in hand, was an apparently continuing imminent deadly force threat to the gunshot victim whom he was nearing, as well as to other nearby bystanders in the mall, and to the officer himself and his nearby police colleagues. The officer fired his service weapon at Bradford to neutralize this apparent imminent deadly force threat. Bradford was hit three times, with one round striking him in the back of the head and stopping him immediately. Interestingly, when questioned the officer would report that he did not give Bradford any verbal commands before engaging him with fire due to the lack of time to do so. Conflicting with this was testimony from two separate witnesses, both of whom would tell investigators that they distinctly heard the officer order Bradford at least three times to disarm before the officer began shooting. This kind of inconsistency of evidence is not uncommon in high-stress use-of-force events. Investigators from the Attorney General’s office would interview three additional officers and 47 other witnesses and would find no evidence substantively inconsistent with that already described. Given the uncontested evidence available to the officer at the time, and the officer’s need to respond to the apparent deadly force threat presented by Bradford in an extremely compressed timeframe, the AG concluded that the officer’s decision to use deadly force against Bradford under these circumstances was legally reasonable, both subjective and objectively, even though that decision was literally mistaken. Again, we’re not required to make perfect use-of-force decisions, we’re required to make reasonable use-of-force decisions. This is also often true, of course, for non-LEO use-of-force situations. Again, the same circumstances would be relevant in a non-LEO use-of-force analysis. The AG’s report concludes by stating that because the officer’s use-of-force was reasonable under the circumstances it was therefore justified and not criminal, and thus the AG was barred from seeking criminal charges against the officer. A closing observation: This kind of “lawful but awful” shooting happens with some regularity, folks, especially in chaotic defense-of-others scenarios. This time it was an officer reasonably if mistakenly shooting a civilian good guy. I’ve seen plenty of cases involving one officer reasonably if mistakenly shooting another officer. Sometimes it’s one civilian reasonably if mistakenly shooting another civilian. Gunfights are dangerous, folks. When you get into a gunfight there’s a meaningful probability that you will die. You might die because you’re hit by a bad guy’s rounds, by a responding officer’s rounds, or by the rounds of another law-abiding gun owner who is trying to do the right thing just like you. Alternatively, it might be you who reasonably but mistakenly takes the life of another innocent party, thinking all the while that you’re targeting the bad guy. I’m not telling you not to intervene to protect others. That’s a call only you can make under the circumstances as you believe them to be. I’m only urging you to know the law, to understand how that law is applied to these kinds of scenarios, to make that decision whether to intervene in an informed manner, to think about these decisions today, and ultimately to be sure the stakes are worth the risks.